The friend-couples are Scott Bourne & Jeremy Fish (USA), Jan Kliewer & Stefan Marx (Germany), Daniel Hakansson & Stefan Narancic (Sweden). 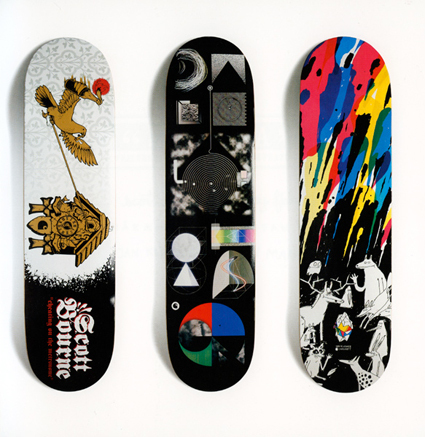 The outcome of their cooperation are three Skateboards, who have exactly the shape and size that the team riders prefer to skate with the artwork of their friend on it. Each board comes with a 40 page book that is shrink-wrapped attached to the board. Get a taste of the book in the gallery below. OEREND HARD 2008/ OLDENZAAL NL!